Registration Now Open for Walk Run Wag 2019! Join us for our 8th Annual Walk Run Wag at Hart Park in Wauwatosa on July 13, 2019! Start your day with a 2 mile walk or 5K run, with or without your pup(s), and then stick around to visit vendors. Can’t join us or just not interested in walking or running? You can “Sleep-in” for MADACC too! Get your shirt shipped to you and help us fundraise remotely. Register today! Whether you are part of the race or not, you can help us by setting up your fundraising page and helping us to raise money for the homeless animals of Milwaukee County. Learn more. Follow our Facebook event page for updates. Can you believe Walk Run Wag 2018 is THIS SATURDAY?! We can’t wait to see you there and enjoy this great event. Remember, all of the proceeds go to help the homeless animals in our community. Because of your participation, you’ve allowed us to help even more. THANK YOU! 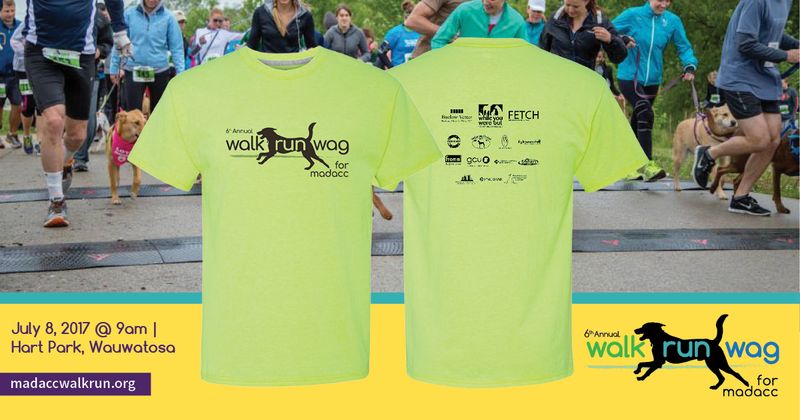 Skip the line and pick up your race packet and/or fundraising shirt (if you raised more than $50, you receive a limited edition WRW 2018 shirt) on Friday July 13, 2018 from 2:00 pm – 7:00 pm at MADACC (3839 West Burnham Street, West Milwaukee). You may also register at this time. If you can’t make it Friday, you can also register and or pick up your packet before the race Saturday. Can’t make early packet pick up? You can pick up your race packet and/or fundraising shirt at the Registration tent from 7:00 am – 8:45 am on race day, July 14, 2018. After registration closes you can pick up fundraising shirts at the Friends of MADACC booth. Didn’t register yet, but want to be part of WRW? No problem – you can register at the Registration tent from 7:00am – 8:45am on race day, July 14, 2018. We’re in Wisconsin, it’s summertime aka construction season. We’re excited to see you at the event so you may want to factor in some extra time to get to Hart Park on July 14th due to construction. State Street in Wauwatosa is under construction right at Hart Park and is only allowing westbound traffic currently. See construction and parking post. Don’t forget to stick around after you walk or run for more fun! Visit local rescue booths and their adoptable dogs, vendors, the agility course and our FOM lure course. Make sure to stock up on our newest Friends of MADACC gear! Grab a beer from Leff’s Lucky Town and some food from Bel Air Cantina! Joining us for Walk Run Wag? You may want to factor in some extra time to get to Hart Park on July 14th. State Street in Wauwatosa is under construction right at Hart Park and is only allowing westbound traffic currently. See map below. Learn more about construction and parking during construction on the Village of Wauwatosa website. Registration is now open for Walk Run Wag 2018! Come for the 5k or 2 mile walk and stay for the food, beverages, vendors, and entertainment. Can’t be at Hart Park on July 14th? Sleep in for MADACC. We’ll even send you the race shirt so it will be just like you were there with us! Don’t forget to set up your fundraising page once you’ve signed up. We even created a cool toolkit to give you some fundraising ideas and materials. Check it out here. Today Is The Day To Walk, Run and Wag! WRW2017 is here! And the weather is forecast to be absolutely perfect for the race and post-race activities. Join us and help support Milwaukee’s neediest animals! Register in person beginning at 7 a.m. at Hart Park. Runners planning to register today, please note: Day-of registration for all 5k participants, with or without dogs, closes at 8:45 a.m. We must cut off all 5k registration at that time to ensure we can get your information to the timing company to record your run accurately. Planning on walking? Don’t worry, there is no cut-off for registration for walkers, because your walk is not timed. Registered in advance online or by mail? You can pick up your race materials beginning at 7 a.m. in the registration area. Look for the “packet pickup” sign. Need a race map? Download the WRW2017 Race Map today to plan your day. We recommend parking on Honey Creek Parkway east of 70th Street (there is a lot of parking on Honey Creek east of 68th). Race time is 9 a.m. Participants running without dogs will start at that time; runners with dogs and all walkers will start in separate waves immediately afterward as decided by the race director, so plan ahead and be prepared to be within earshot of the start line at 9 a.m. regardless of whether you’re running or walking. We wish all our runners a personal best today, and ALL of our participants an amazing day! A special thanks to all of our sponsors, our volunteers and every single supporter (this means you!) for helping to make WRW2017 a success. See you at Hart Park! Join Us Saturday for WRW2017! Early Packet Pickup is Friday, July 7th, 4-7 p.m. at MADACC, 3839 W. Burnham St., West Milwaukee, for anyone who has registered in advance by mail or online. We strongly suggest you bring a copy of your registration confirmation email, either printed or on your smartphone. The packets are alphabetically organized but occasionally a participant’s packet ends up misfiled. This has happened a handful of times, but we don’t want it to happen to you! Having the registration confirmation in hand makes it much easier to troubleshoot. Runners planning to register July 8 before the 5k start, please note: Day-of registration for all 5k participants, with or without dogs, closes at 8:45 a.m. We must cut off all 5k registration at that time to ensure we can get your information to the timing company to record your run accurately. Planning on walking? Don’t worry, there is no cut-off for day-of registration for walkers, because your walk is not timed. Need a race map? Download the WRW2017 Race Map today to plan your day. Race time is 9 a.m. Participants running without dogs will start at that time; runners without dogs and all walkers will start in separate waves immediately afterward as decided by the race director, so plan ahead and be prepared to be within earshot of the start line at 9 a.m. regardless of whether you’re running or walking. WRW2017 is rain or shine. See you there! Important New Information For All WRW2017 Participants! Runners planning to register July 8 before the 5k start, please note: Day-of registration for all 5k participants, with or without dogs, closes at 8:45 a.m. We must cut off all 5k registration at that time to ensure we can get your information to the timing company to record your run accurately. Planning on walking? Don’t worry, there is no cut-off for day-of registration for walkers, because your walk is not timed and you do not receive a race bib. We always have long lines for day-of registration, which opens at 7 a.m. Please plan accordingly. We don’t want anyone to miss out on the fun. Why not skip the lines on July 8 and register in advance? Online registration is available through July 2 and adults who register online are guaranteed a WRW2017 shirt in your preferred size. This year’s eye-catching WRW shirt is guaranteed only to participants who register in advance, so sign up by July 2 to get yours!